Putin Push to Dump Dollar Proves Hard Sell With Russia Inc.
Russia’s central bank dumped $101 billion last year in its biggest-ever shift away from the U.S. currency amid fears of new sanctions. But the Kremlin’s drive to wean the rest of the economy off the greenback has been slower going. Despite President Vladimir Putin’s regular public exhortations to accelerate “de-dollarization,” even the country’s state-owned companies are sticking to the currency. Shifting to the ruble, yuan or euro means higher costs and difficulties finding banks to handle business, according to executives. The government’s program to speed the shift has barely gotten off the ground, officials say, speaking on condition of anonymity because the facts contradict the public line. 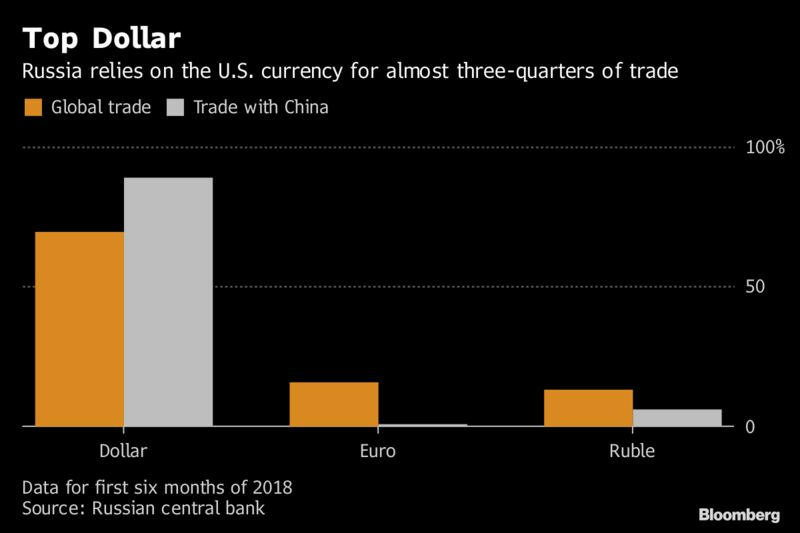 Russia relies on the dollar for almost three-quarters of its $598 billion annual trade, though less than 5 percent of those deals are with the U.S. Even with China, which has joined the public calls for reducing dollar reliance, 90 percent of trade is done in greenbacks. Late last year, Beijing shelved a deal with Moscow to boost direct ruble-yuan operations amid an ongoing trade dispute with Washington. Russia’s commodity exports are mostly quoted in dollars, making customers unwilling to take payment in other currencies. 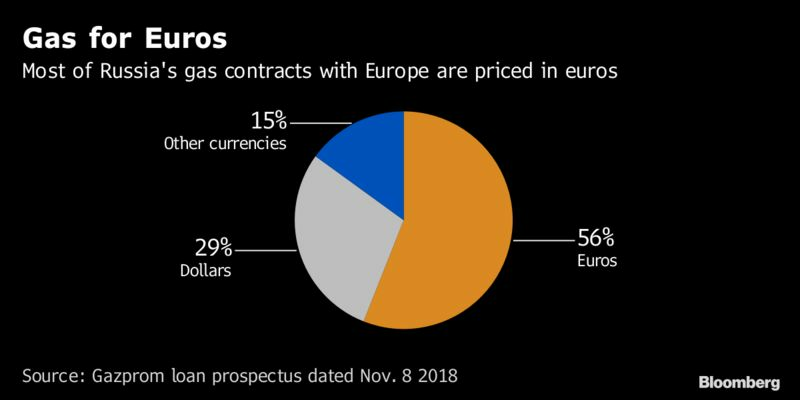 Markets for euros, rubles or yuan aren’t nearly as big as those for the greenback and financial infrastructure is less developed, raising costs. 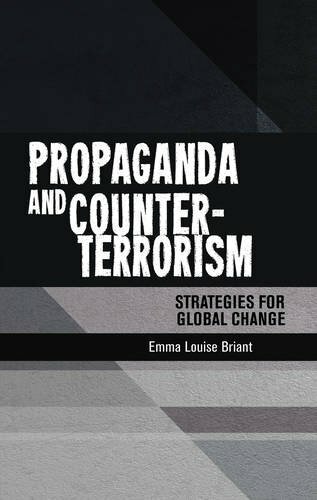 But sanctions imposed over the Ukraine crisis and alleged election meddling, as well as the fear that Washington could impose even worse restrictions, potentially cutting off access to the dollar-based financial system, have led the Kremlin to step up efforts to find alternatives. 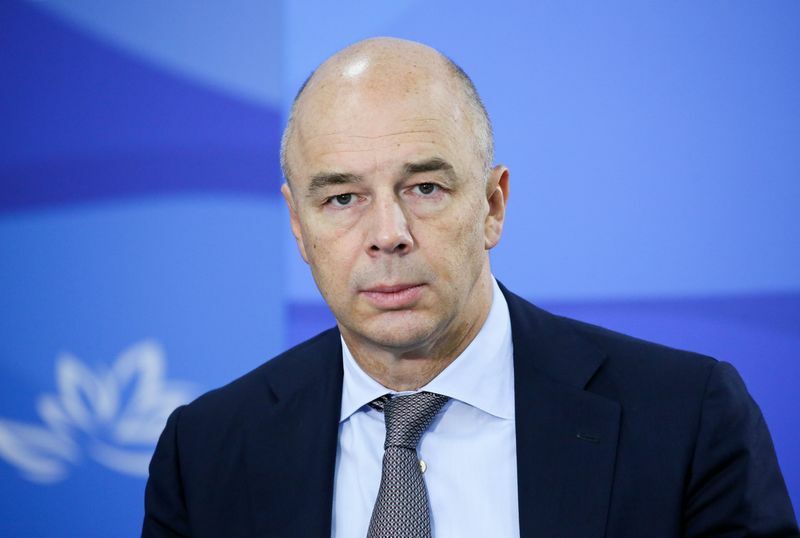 A third of Russian transactions in dollars are delayed, sometimes by as much as a month, by sanctions concerns, according to Finance Minister Anton Siluanov. The central bank has built a domestic system to allow banks to make payments even if Russia is cut off from the global network and some companies have begun to pull funds beyond the reach of the U.S. Treasury. The most dramatic move came after a harsh new round of sanctions last spring, when the central bank shifted $101 billion in reserves — more than a fifth of the total — into euros, yuan and yen. 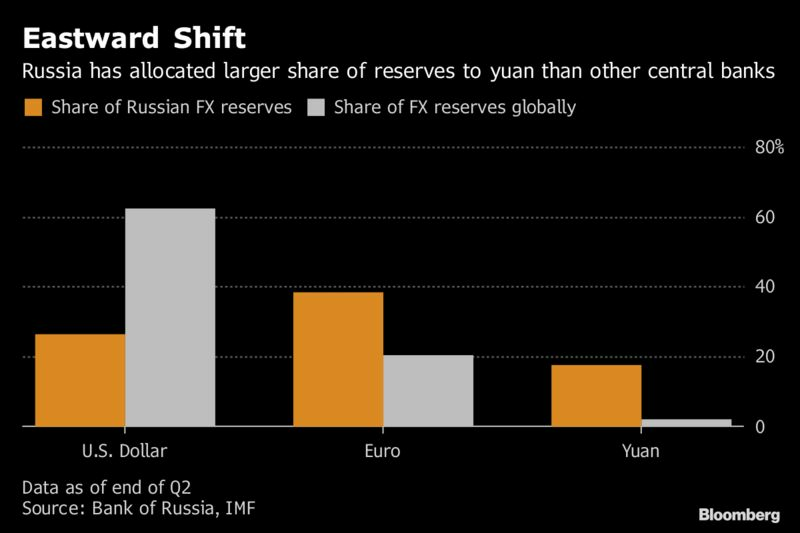 The moves mean Russia now holds about a quarter of global yuan reserves. The European Union is working to stimulate euro use in trade and finance. But efforts to create a mechanism to allow companies to operate in Iran without falling afoul of recently reimposed American sanctions have struggled given the broad reach of the U.S. financial system. Many steps taken by Russia’s biggest companies to show they are trying to increase use of other currencies have been largely symbolic. State diamond monopoly Alrosa set up a system for accepting payments in foreign currencies, but those deals made up less than 0.1 percent of sales last year. The Eurasian Development Bank, the special institution Russia set up to stimulate ties with its neighbors, operates in dollars and pays salaries in the U.S. currency, according to its head, Andrey Belyaninov. Many former-Soviet nations would prefer to borrow in rubles, but Russian state companies still prefer the greenback, he said. The Finance Ministry and central bank have been working on a de-dollarization program to stimulate the shift and Siluanov said in late December energy companies will be asked to provide their plans. But officials familiar with the efforts say they’re largely for show and unlikely to yield major results any time soon. Lukoil PJSC head Vagit Alekperov told Bloomberg television in December that Russia’s second-largest oil producer isn’t looking into diversifying its currency use because it would be “almost impossible” to switch away from the dollar. Proponents of the drive point to hard data showing that the dollar’s share in Russia’s total trade is gradually declining. That trend existed even before Putin began his campaign against the currency, however, and it reversed slightly in the first half of 2018. There are some exceptions. Severstal PJSC, the steelmaker controlled by Russia’s second-richest man, said last year it would start receiving euros for most of its exports. Gazprom PJSC is already paid for most of the gas it sells to Europe in the common currency. A government proposal to grant tax breaks to companies that invoice their exports in rubles might also help at the margin. Meanwhile, ordinary Russians seem to be responding to the Kremlin’s calls for de-dollarization by stocking up on the U.S. currency. Sberbank PJSC, the country’s biggest bank, recorded $2 billion in foreign-currency withdrawals in August and September as the U.S. ramped up threats of new sanctions. This made me chuckle and then wonder if it is true. I’d like to see some substantiation of this assertation. What do you know about this bank? Looks like they’re sole purpose is to “integrate” economies of former satellite nation-states with Russia – the reformation of the USSR.